with a long list of changes, especially for parents with young children. Finding your way around schools, choosing new doctors, and looking for your favorite corner store or coffee shop are just a few of the big and small tasks ahead of any family who is moving. That includes finding a good dentist for your child. Visiting the dentist can be stressful and scary for children, so it's important to find the right dentist who is expert at comforting and caring for kids. 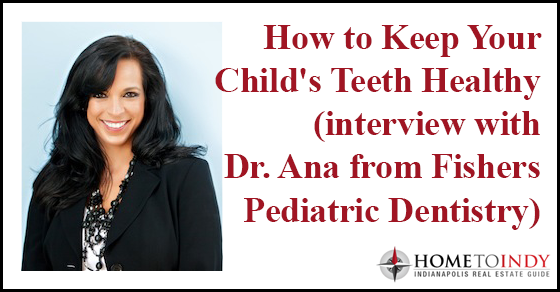 So as part of our "Tips for Moving to Indianapolis" series, I asked an Indianapolis pediatric dentist Dr. Ana from Fishers Pediatric Dentistry in Fishers, Indiana for some advice on how to prepare a child for visiting a new dentist as well as basic guidelines on keeping your child on track to have healthy, bright smiles. How should parents prepare their children for their first visit to the dentist, or for meeting a new dentist if they're moving to Indianapolis? As a parent, we tend to get nervous about the experience too! The best way to prepare your child for their first visit is to have a positive attitude and not to show your own personal apprehensions around your child. We encourage you to talk to your child about their upcoming visit and educate them on the importance of keeping his/her teeth and gums healthy. Showing videos and pictures of the office can help familiarize and reduce fears or anxiety. When should parents take their child for their first visit to the dentist? Remember… First Visit by First Birthday! Keeping your child’s smile healthy is important. A common dental myth is that baby teeth are not important because they fall out anyway; however, they serve many important functions in a child’s growth and development. They are important for eating, speaking and holding space for permanent teeth. If a baby tooth with a cavity is left untreated it can lead to pain causing difficulty with eating, speaking, sleeping and also loss of concentration at school. Untreated decay can lead to a dental infection called an abscess. This infection could potentially affect the development of the permanent tooth developing under the baby tooth as well as result in the need for extraction. Severe dental infection can even spread to other parts of the body, compromising overall health. At what age should parents start watching out for problems with their children's teeth? If a tooth is present, it is capable of getting a cavity. I recommend for parents to establish an oral care routine for their child before the first tooth appears by wiping the mouth and gums with a washcloth at bed time. When teeth begin to erupt, I recommend using a soft bristled child size brush twice a day, after breakfast and before bed. It is also important to remember to wipe your infant’s teeth with a wet washcloth after nighttime feedings. If you are putting your child to bed with a bottle, choose only water. Putting a child to bed with a bottle containing sugary liquids such as milk or juice can increase the chance for cavities. What are some of the most common dental problems in infants, toddlers, and children? The most common childhood disease is dental decay - 5 times more common than asthma! It can easily be prevented by establishing good oral habits and visiting a dentist regularly for prevention and education. The American Academy of Pediatrics as well as the American Academy of Pediatric Dentistry encourages parents to establish a dental home and have their child seen by the age of ONE, regardless if your child has a tooth or not. Visiting the dentist at an early age is just as important as ‘well baby visits’ with your pediatrician or family doctor. The ultimate goal is to provide knowledge on how to prevent early childhood cavities and establish a trusting relationship with the dental team. What are some ways that parents can help keep their children's teeth healthy? What are some warning signs of dental issues in children? There are several dental issues that we could discuss; however, the most important issue would be cavities. The warning sign and beginning phase of a cavity is a noticeably white lesion on the tooth enamel. This is called decalcification, or in other words the breakdown of the enamel. There are measures that can be taken if caught early enough to help strengthen these areas so that they do not progress further into a cavity. This is a primary reason why early dental care is recommended, so that we can provide education on how to prevent early childhood cavities. Another common dental concern is malocclusion, or the misalignment of teeth. This can happen early on in childhood and be induced by habits such as pacifier use and thumb sucking. Talk to your dental professional about creative behavioral modifications to help your child quit and when to seek treatment. The common age to be evaluated by an orthodontist is around the age of 7. Do you have any advice on what parents should feed their children at various stages to promote healthy teeth? Big thanks to Dr. Ana for sharing this guide to keeping children's teeth healthy! If you are new to Indianapolis and looking for an excellent pediatric dentist, visit Fishers Pediatric Dentistry and learn all about their services. You can find more tips on their website as well as how-to videos for kids and parents!